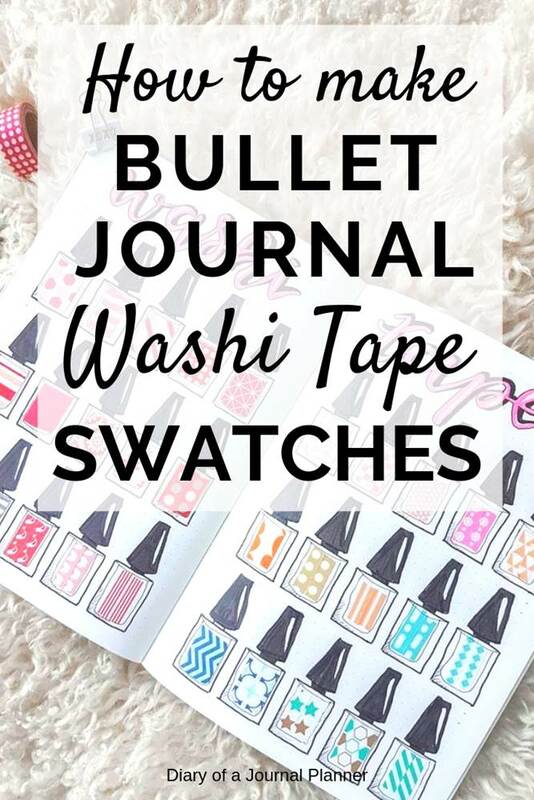 If you have a large washi tape collection like I do, you will find that a bullet journal washi tape swatch or sample page is a must! A washi swatch is a small piece of washi tape that is taken to represent the larger washi tape roll. 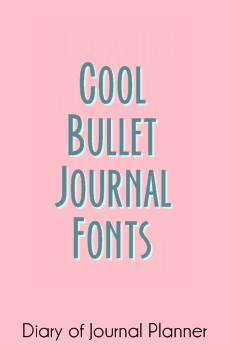 A small sample taken from your existing rolls can assist you in designing your bullet journal and putting together matching designs. This spread becomes very important when you have a larger collection of tapes that is stored away. 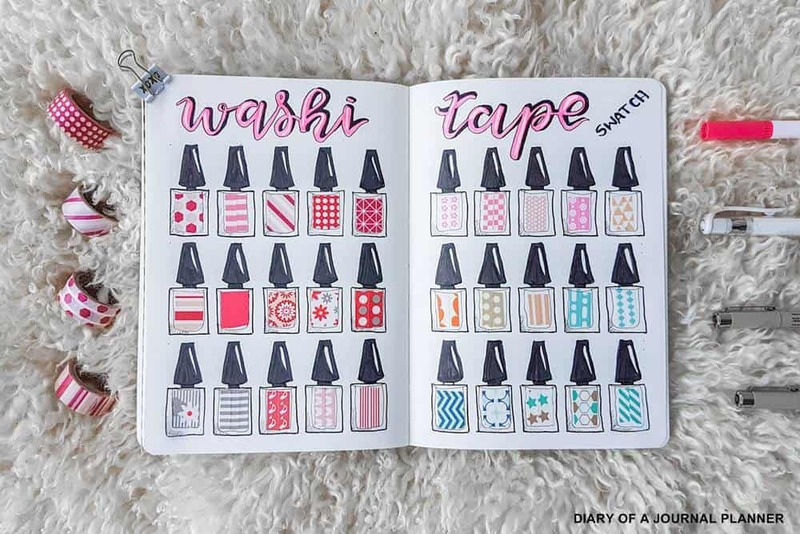 A washi tape swatch is also a very fun bullet journal washi project to make. Who doesn’t love playing with washi? I am a huge fun of stationery (surprise!) and nail polishes. 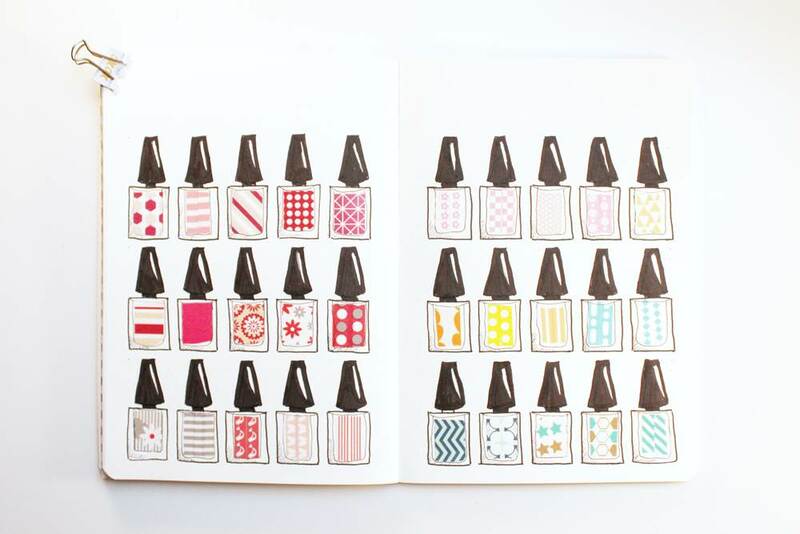 So I decided to make a washi tape sample page using nail polish bottles. 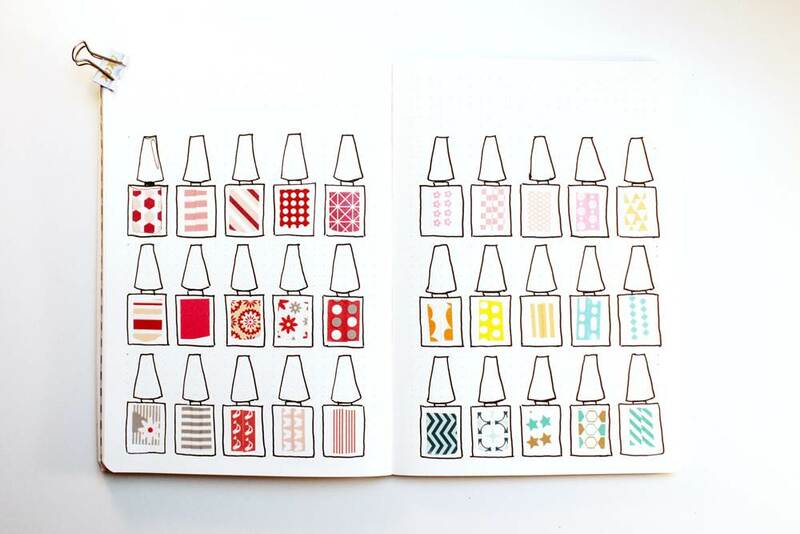 Read on for the step-by-step tutorial for making these washi tapes swatches in your bujo too. You can make a tape swatch in any for you like, just strips of tape will do. 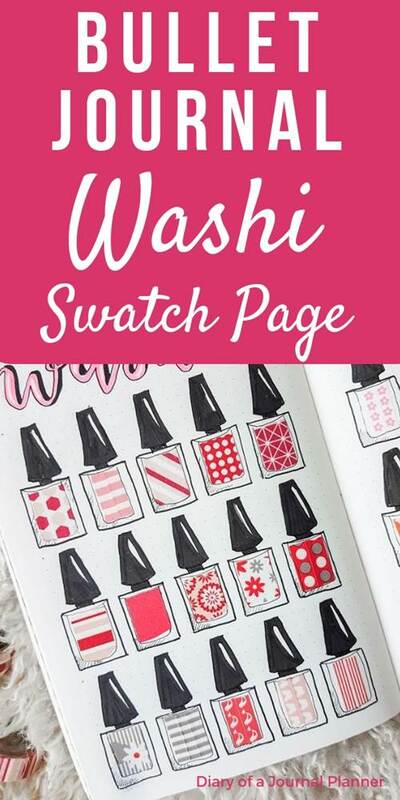 But, if you enjoy the artistic side of bullet journaling you can follow my tutorial to make a nail polish swatch for washies. Sakura Pigma Micron Pens (#005, 08 and the brush pen) in this set here. 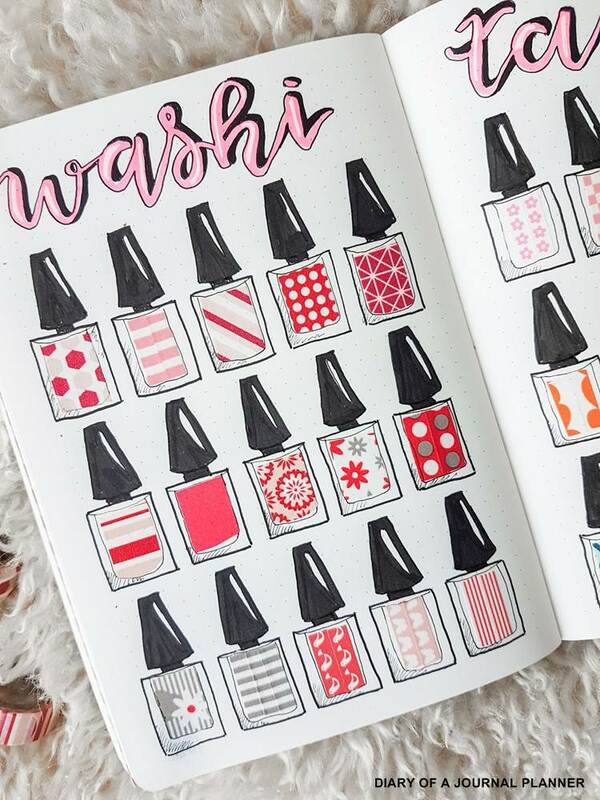 I started by doodling one nail polish bottle and check how it would fit in my bullet journal page. Love doodling? 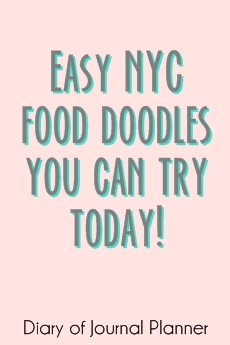 Check out all my doodle posts here! I measured roughly how they would fit in my journal and I was able to add 30 nail polish bottles to my open A5 notebook using 2 pages. Each bottle doodle took about 4 square grid in width and 9 square grids in height, producing 3 rows of 5 bottles per page. So I counted from the bottom of the page the space that my 3 row of washi tapes would need before I started doodling. This was necessary for symmetry and also to make sure I had the header space where later I was going to add my swatch header. 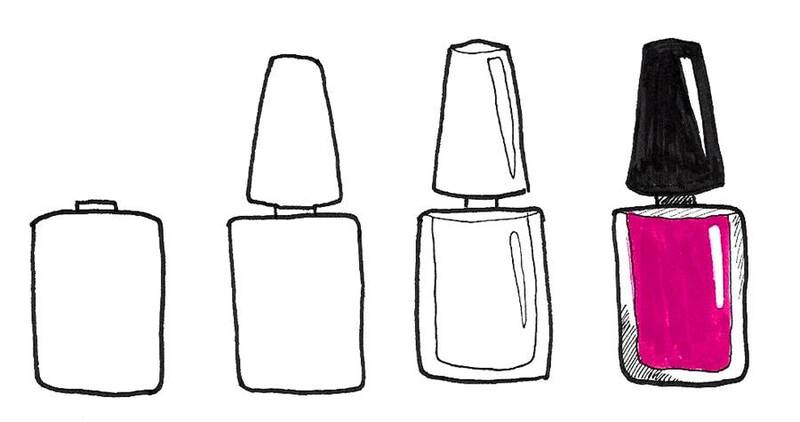 The first step was to draw one bottle and see how it looked complete. I tested one washi tape in the middle too. 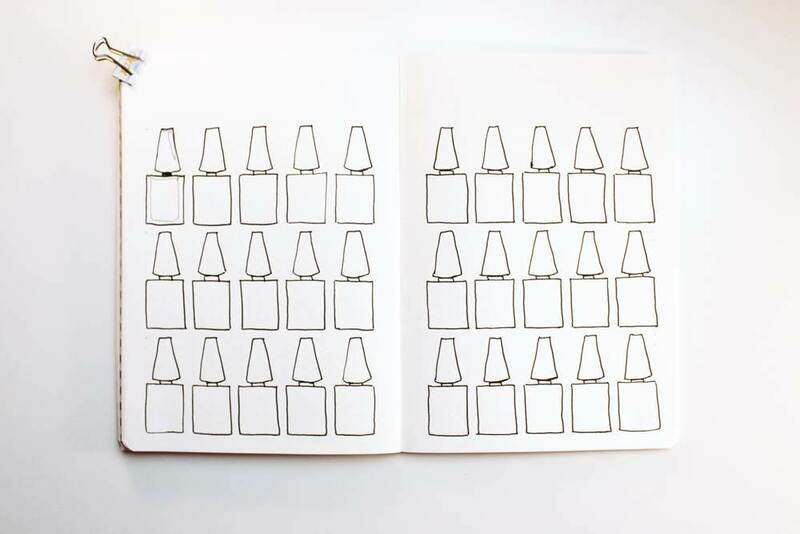 Once I was satisfied with how it would look I went ahead and doodled all 30 bottles using my Sakura Pigma Micron #08. Next, I added the washi tape in the middle. Note that, just as I did in the nail polish bottle doodles, I didn’t fill the bottle entirely with the washi swatch. I left the edges of the bottle free so I can doodle around it and make the same glass effect that real nail polish bottles have. It was roughly the exact size for my 10mm washi tapes. However, when adding my skinny tapes I had to add 2 strips side by side to fill in the bottle space. Now it was time to finish the doodle and color the bottle cap. The little doodle details and shades were made with my Sakura Pigma Micron #005 and the cap was painted with the Sakura Pigma Micron Brush pen. I love these pens, they have archival ink and don’t bleed or ghost on your journal. For more information about my favorite pen check this post here! The next step was adding the header, I have been practicing my brush lettering and I am super happy with how it turned out. I added some shades to the header and used the white gel pen to decorate. This is how my bullet journal page for washi tape swatches turned out at the end! If you have a lot more washi tape than 30 you can have more pages. You could change the design for every page and try different washi swatch doodles ideas, such as gift tags, banners, gift boxes etc. Or you could also add thematic washi tape collections for every month using the latest washi you are into at the moment. There was many washi tape swatch ideas, just let your creativity flow. What do you think about this page? 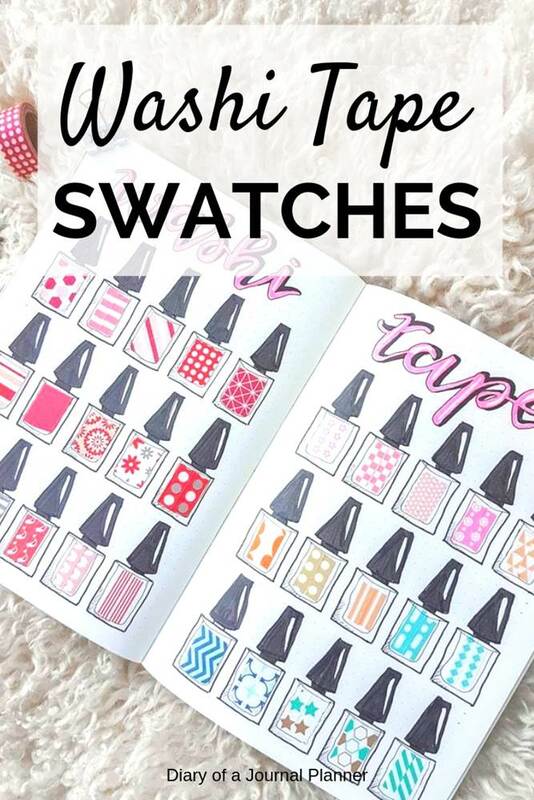 Do you also have a washi tape swatch in your bullet journal?